Banff locals, Michelle Locke and Audrey Hebert, have become two of the Bow Valley’s most inspiring examples of home-trained talent taking on the world of competitive snowboarding at the highest level, but getting a footing on those winner podiums is no easy feat. Behind the glory of big mountain riding, is the gruelling training schedule, numerous travel dates to mountain destinations around the world, and long periods away from the comforts of home – not to mention the fundraising, wrangling of sponsorship deals, and hard work that comes with meeting the financial demands of pursuing a sport at the professional level. Having both proven their worth on their boards during qualifying rounds over the past three seasons, Michelle and Audrey have each earned coveted places at the Freeride World Championships, experiencing the thrills, adrenalin, tension and pressure of competing with the very best in the freeride biz – each representing Canada in the female snowboarder category. Audrey, 29, originally from Shawinigan, Quebec and living in Banff since 2006, finished first overall in the 2015-16 Freeride World Qualifiers (from The Americas category), competing at Kicking Horse Resort, Crystal Mountain Resort in Washington, and the Taos Freeride Championships – guaranteeing her spot on the main Freeride stage for the 2017 season. She openly admits her first Tour experience was a run of mixed emotions. “Being on the Tour was incredible, a really big deal for me and something I’d strived hard to get to. “Being on the Tour was incredible, a really big deal for me and something I’d strived hard to get to. But, I have to admit, it was also very stressful. But Audrey had worked tirelessly, both on her board and off, to take herself to that level of competition – a situation many athletes share. Working two full-time jobs and organizing local fundraisers were just part of the process of realizing the dream of reaching the Tour. “To compete at that level, you need to be all in,” Audrey says. “You find yourself in a situation where you have to train, train, train, but it comes at a cost. I’ll tear through two pairs of boots a season; you’re going hard so your gear needs to be replaced often. Qualifying for the Tour is one thing, but then as an athlete without major sponsorships in place, it’s up to you to fund your position, meaning long-haul travel costs. It’s the reality we face for wanting to be out there and on that leaderboard. This is something that Michelle, 38, can easily relate to. Having spent the past decade perfecting her big mountain prowess, Michelle is no stranger to a gruelling competition, holding the title for being the first Canadian female snowboarder to qualify for the Freeride World Tour – which she attended in the winter of 15-16, travelling to multiple destinations in Europe to compete. 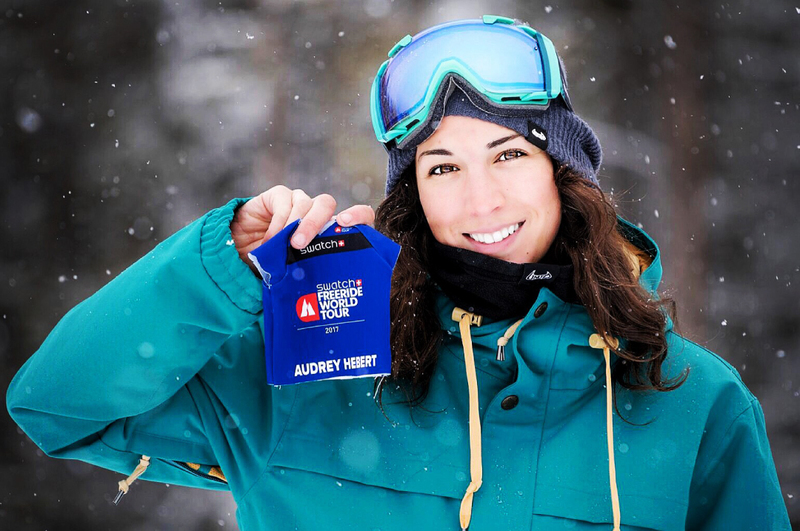 The stakes are high for female snowboarders to reach the Tour, with Michelle guaranteeing her place by finishing first overall in her qualifying year (2014-15), which is the only female spot open for The Americas – the Tour accepts two females each year, one from The Americas and one from the rest of the world. What makes this achievement particularly impressive is that Michelle only started making tracks on a snowboard in 1998, when she moved from her home town of St. John’s, Newfoundland to Banff, in the search for deep snow. She would “cry on a daily basis” until she found her knack on the steep mountain faces, but she kept at it. It’s obvious that Michelle isn’t one to give up. “You really need to have that passion for snowboarding, and the drive to pursue competing at our level,” Michelle adds. For Michelle and Audrey, the support from the Banff community has been a welcome rest bite from the pressures of funding their training and entry to world-class competitions, and is a key reason they continue to push the limits and keep focused on their next competition. Both Audrey and Michelle are athletes of the Wim & Nancy Pauw Foundation Youth Sport Fund, which is in place to support athletes within the Bow Valley reach their potential by breaking down the barriers of sports, through direct donations from the Fund. The Pauw Youth Sport Fund offers sponsorships annually, which remain in the Bow Valley to offset some of the costs of training and travelling to competitions for local athletes. “I’ve received funding from the Foundation for nine years now, and it’s just incredible to have such support here locally in Banff, I’m so grateful,” Michelle adds. So, as two local legends of powder that have made their name on the world Freeride circuit, what words of wisdom do Michelle and Audrey have for the next generation of Bow Valley athletes? “It’s my nature to find a challenge,” Audrey says, “and once I find a sport, I want to be the best at it – just push harder, and harder,” – a trait Audrey admits is one of the reasons she’s now a snowboarder. Having started skiing at two years old with her family in Quebec, Audrey found herself as a highly-proficient, eight-year-old skier in search of a new task, and so quickly switched her skis for a snowboard. “What I’ve learned this past season by competing on the Tour, is that competition is important, but it’s also okay to fail. I had all these expectations of the Tour and how I wanted to ride, I put a lot of pressure on myself and I was nervous. I placed 4th, which I’m so proud of, but I wasn’t happy with all my lines. There were conditions I needed to deal with on the mountain that couldn’t be planned for, and I know I could have done better – but that’s fine. It’s about keeping focused and setting goals, but being realistic and not too hard on yourself. That’s my advice. Michelle adds: “For me, after not making the 2017 Tour due to a neck-and-neck tie at the Qualifiers, I had to do a lot of soul-searching ahead of last season, as to whether I even wanted to do this at a competitive level anymore. But, instead, I just went for it completely in the Qualifiers, and was thrilled to be named best overall North American Champion. This summer, I’ll be training just as hard as if I was going to the Tour. 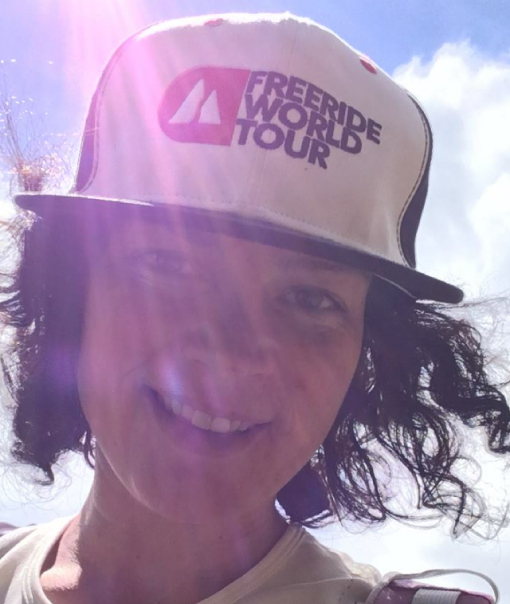 Michelle Locke takes Best Overall North American Champion at the 2017 FreeWorld Qualifiers. 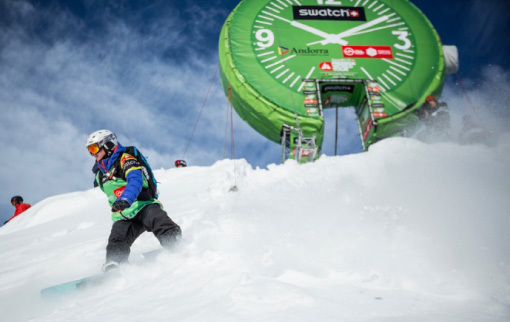 Audrey Hebert competing at the 2017 Freeride World Tour. GoPro Run from Audrey Hebert Competing at the 2017 Freeride World Tour.